You can easily enjoy great winter snowscapes without fighting the drifts and the ice: Just take a train. Enjoy the sights from a comfortable, wide seat, through a panorama window, maybe while sipping something cold or warm. Except in unusual circumstances, railroads keep their tracks open through snowfall heavy enough to shut down the highways. Many travel on routes with better sightseeing than you can find from any highway. And many are on regular trains, at regular fares, not special excursions. — The California Zephyr, between Chicago and Emeryville (for San Francisco), provides daytime sightseeing over the Rockies and Sierras on successive daytime segments. Daylight sightseeing through the Rockies is better westbound. If you just want the mountains, start or end your trip in Denver rather than Chicago. — The Empire Builder passes next to Glacier National Park in Montana on its trip through the Rockies, and it also passes through the Cascade Range in Washington. The best daytime Glacier Park sightseeing times are on the eastbound trip; in winter, you don’t get much daylight through the Cascades in either direction. Other Amtrak trains with the potential for winter snow include the Pennsylvanian, through the Alleghenies from Pittsburgh to Philadelphia; the westbound schedule isn’t good for daylight in the Appalachians. The Lake Shore Limited through the Berkshires, between Boston and Albany and the Cardinal through West Virginia are also candidates. 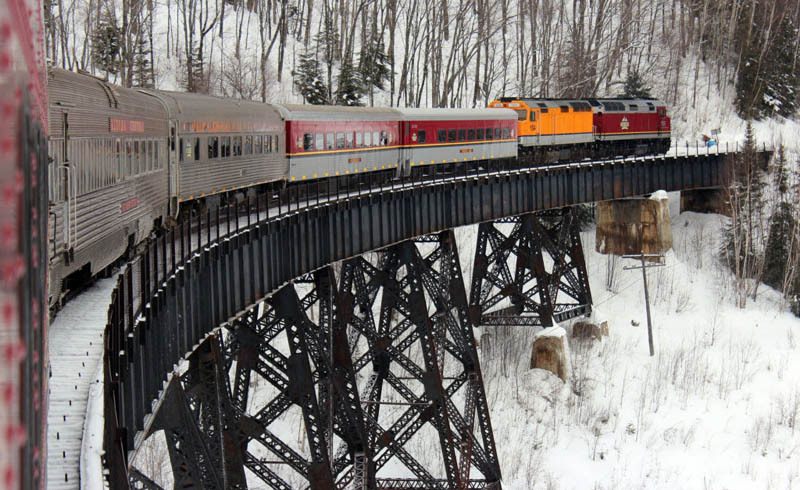 North America’s top winter rail trip used to be the Canadian, between Toronto and Vancouver, especially the segment between Edmonton and Vancouver. Unfortunately, congestion on the Canadian National has caused a schedule revision that no longer covers the top mountain scenery during daylight. VIA Rail is fixing that problem but not until next spring. As far as I can tell, the Rocky Mountaineer between Vancouver and Banff surprisingly doesn’t operate in the winter. — My favorite is the Bernina Express from Alpine Chur over the Bernina pass and down a spectacular line to semi-Mediterranean Tirano, Italy. This route is a UNESCO World Heritage site, and it’s the one most often pictured on posters and ads. Winter or summer, it’s one of the world’s great scenic rail journeys; trains operate all year, although at some times you have to change at Ponteressina, near St. Moritz. The schedule favors southbound trips for best daylight viewing. — The Glacier Express is probably the best known Swiss panorama train. It runs between St Moritz and Zermatt all year with the exception of a break from October 23 to December 10. 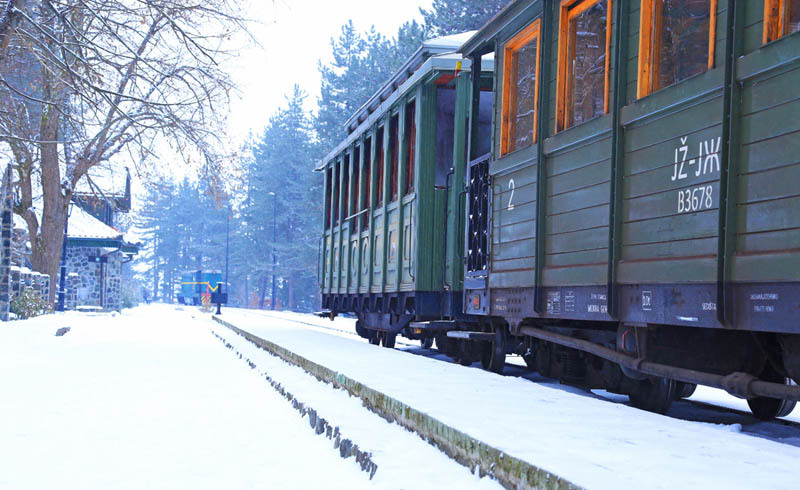 Winter trains with panorama cars operate once daily in both directions. If you prefer, you can take less than the full trip, but don’t miss the section between Chur and St. Moritz over the UNESCO World Heritage Albula route. A full eight hours in the spectacular Alps–what more do I need to say? — The new Gotthard Panorama Express takes you over the former mainline that has been bypassed by the new 35-mile Gotthard Base Tunnel. The new tunnel cuts the travel time substantially, but 35 miles in a tunnel under the Alps isn’t a big sightseeing event. Instead, take the panoramic train over the steep grades, curves, and spiral tunnels along deep river valleys and gorges. The Panorama Express trip runs between Lucerne and Lugano, combining a boat trip on Lake Lucerne with the train. All three Swiss trains are covered by Swiss Travel Pass. But if one is enough, you can buy individual tickets. All three require reservations, with an extra fee. Buy either way online at sbb.ch/en or raileurope.com. You can find good snowscape trains in many other countries with high mountains, from Austria to Japan to New Zealand. Check out the rail options wherever you’re heading.